For information on your closest dealer please get in contact with us through our contact form in the Help Section. FS Quattro is a unique climbing rubber compound developed Boreal. This compound provides excellent abrasion resistance and consistent performance over a wide temperature range. FS Quattro rubber is a specific formulation developed by Boreal. It was designed to provide consistent high performance over a wide temperature range, and to offer a long life span. This highly versatile rubber is ideal for all-round rock shoes, with a perfect blend of high friction and durability. When your climbing takes you onto long, multi pitch routes with severe cracks and sustained edging, your shoes should offer great support and ideally some ankle protection. Boreal Ballet Gold is the perfect choice. The Ballet Gold features a pointed, symmetrical last shape, ideal for getting toes into small pockets and thin cracks. The high quality split leather upper is combined with anti-stretch stitching and a full canvas lining to ensure the shoe stays comfortable and retains shape over time. A high cut ankle both protects and supports, while full length lacing securely holds the foot for superb precision. The board lasted construction (a construction method normally associated with high quality trekking boots) provides excellent underfoot support, allowing the use of micro edges. Meanwhile the sticky and durable FS Quattro™ rubber gives superb friction. The Ballet Gold is the ideal choice for technical crack climbing and edging, alpine rock and long free routes on big walls. Who says a performance shoe needs to be asymmetric? With an incredibly precise, pointed toe, stiff board lasted construction and sticky FS Quattro™ rubber, the Boreal Ace demonstrates there is another way. Although the fashions for rock boots have pushed development into increasingly asymmetric shapes, many people can still benefit from the more classic shape of shoes such as the Boreal Zephyr. 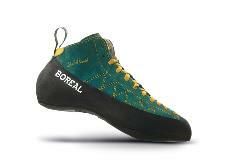 Yosemite, Troll Wall, Greenland; wherever your next adventure takes you, the Boreal Big Wall is the shoe you need to wear. Specifically designed for the rigors of long, multi pitch climbing and using aid, the Big Wall is supportive, comfortable and durable.